Whether it’s navigating busy aisles during a sale or queuing up to try on jeans in unflattering changing rooms, shopping can be a tiring and arduous task. But a raft of new technology is changing this by making it easier, more sociable and fun to part with your hard-earned cash. 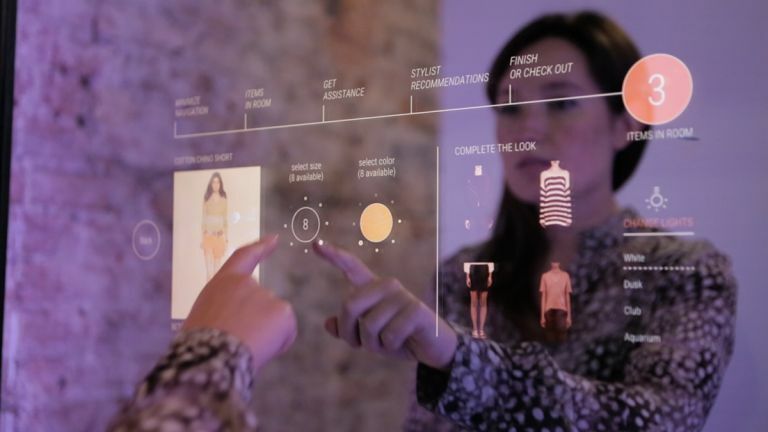 As well as cool in-store technology, apps now give shoppers simpler ways to search for and try on clothes, plus more convenient ways to pay for them. So why not give smarter shopping tools a whirl next time you’re in the market for some retail therapy? From visual search apps to 'magic mirrors', we’ve rounded up our favourite ways to shop. Finding a replacement for a beloved jumper or the perfect coloured jacket to match your trousers can become a labour of love and take hours when it comes to scouring rails on the high street. But visual search is changing that. The Snap Fashion app and website allows you to search for clothes using images, not words. For example, you can take a picture of a magazine image of a celebrity’s outfit, find a replica to suit your budget, and buy it – all within the free iOS/Android app. Snap Fashion also enables you to search by colour, so you can find the perfect coloured shoes to match a shirt. Alternatively, you can search by cut, making finding clothes that suit your body shape much easier. The British company has partnered with more than 250 retailers, including big names such as Topshop, Mr Porter, Farfetch, Uniqlo and Selfridges, letting shoppers browse using its technology then buy securely from the shops they trust in a few easy steps. Snap Fashion is not the only company using visual search to increase customer experience, with magazines, online stores such as Asos and social media sites including Pinterest all using the technology, too. Augmented reality (AR) is proving a game-changer in retail, allowing shoppers to try before you buy without having to physically put on clothes or take products home. Ikea was among the first retailers to make use of the technology by rolling out an AR app that enables you to see virtual furniture in your own home, so it’s easy to find a sofa to fit your living room, or to decide which rug will best complement the colour scheme. Makeup brand Rimmel has also launched an AR app, called Get the London Look, which lets you see what somebody else's makeup would look like on you. All you have to do is point your phone at a photo or a person’s face to try on the same look using the ‘personalised augmented reality mirror’. Similarly, Gap’s DressingRoom Android app (developed in partnership with Google) enables you to virtually ‘try on’ clothes using your smartphone. You can choose a style you’re interested in, then pick one of five body shapes that matches your own best or input measurements, before using AR to see what it might look like on. AR is in-demand from the retailer sector both in apps and in-store. In spring this year, Zara rolled out an AR experience across 120 of its largest stores around the world. For two weeks, shoppers could download the Zara AR app and hold it up to shop windows or a sensor in store to see models come to life on their phones. The virtual models strutted across windows, but without a phone and AR technology, others simply saw a static mannequin wearing the same outfit. Zara deliveries also came with a QR code, allowing shoppers with the app to see special visuals when they hovered their phone camera over it. Despite more people doing their shopping online, the high street is embracing technology to offer something new in shops and entice people inside. Burberry was among the first brand to offer customers a magic mirror at its London flagship store, back in 2012. It enabled customers to slip on clothing with a microchip attached, then look into a mirror that transformed into a screen and showed them how the garment looked on the catwalk. While this may have had the wow factor, it was of relatively little use unless you had a model physique. But now Mastercard has announced it has developed a digital smart mirror that helps you beat the queues and pay for goods from the privacy of the changing room. The Oak Mirror uses RFID (radio frequency identification) technology embedded in clothing tags to recognise which items are brought into a changing room. You can tweak the lighting, view and request different sizes and colours of garments on the mirror, and ask for specific physical items to be brought to the changing room via a request button. Synced with a store’s catalogue, it can also offer intelligent suggestions for new items based on your current choice of clothes. The mirrors are currently being used in selected stores including flagship Levis in the US, and are set to arrive in the UK ‘soon’. When it comes to clothes, a company called Metail is leading the way in letting us try on garments virtually, to navigate the fashion minefield of inconsistently sized clothes, complicated sizing charts and varied returns policies from online retailers. The company’s MeModel Experience allows you to try on clothes online, by creating a realistic 3D avatar of yourself, including your body size and shape, in less than 10 seconds. You can then use this to try on clothes without the hassle of getting undressed. As well as being a useful guide that might help you minimise the number of online shopping returns, it’s also fun. For example, the company has used its technology to let users ‘slip on’ Megan Markle’s wedding dress and try out her regal style. The company says its MeModel digital try-on experience can be used on desktop or mobile when you're shopping online. Obsess' technology allows brands to create a 360-degree virtual store so shoppers at home can click on items on shelves or mannequins and shop on your phone as if you're in a real location. The brainchild of Neha Singh, who was previously an engineer at Google and head of product at Vogue, Obsess’ aim is to rid the world of flat grid e-commerce interfaces and make shopping more fun and memorable (and easy to browse and discover tempting additional purchases). The virtual stores can be based on physical retail locations, such as Farfetch’s hip flagships, or completely digitally generated environments. You can access these VR environments via a shop’s website on your computer or phone, moving your handset around to see the full store, tapping on arrows to move through the space and pressing + icons on any product to get more information or buy it. There’s no need for goggles, although the technology could be used with virtual reality headsets for an extra immersive shopping experience. Brands ranging from Alibaba to luxury crystal retailer Swarovski have experimented with virtual reality. Last year, Mastercard teamed up with Swarovski to launch a VR app immersing users in a tastefully decorated home filled with crystal pieces that they could purchase using Masterpass, Mastercard’s digital payment service. Once in the VR environment comprising five rooms, visitors could learn about the stories behind each piece, read through descriptions, see the pricing, and in some cases watch videos about them. As we watch more and more TV and video content on phones and tablets, it makes sense that we could shop items in them. Instead of scrolling through a whole bunch of images of tops, for example, you can now watch videos of models strutting their stuff and click on the moving images if there’s anything that takes your fancy, and buy it. Luxury brands including Jo Malone, Valentino, Burberry, Jaguar, Nars, Bvlgari, Galleries Lafayette as well as M&S and John Lewis have worked with Smartzer to produce videos that make impulse shopping more tempting than ever. While funky videos and augmented reality apps may make shopping for higher value items fun, it’s unlikely they’ll do much to make buying a pair of socks more glamorous. Enter automated purchases. It’s predicted that consumers will increasingly make automated purchases so essentials arrive on a monthly or weekly basis, saving us time and effort. Amazon’s Dash button is one recent example that’s catching on. You buy buttons individually and each one is assigned to a specific product. So when you’re running low on coffee, for example, you could press a Nescafe button placed near your kettle to order a new jar without any fuss, with the money coming from the bank account linked with your Amazon account. Now there’s Dash Replenishment too, which enables connected devices – such as a smart water filter – to monitor supply consumption using sensors to measure weight or flow. The measurement then signals an automatic reorder of supplies before they run out. For example, a Dash Replenishment-enabled washing machine can automatically reorder detergent or a smart printer can automatically reorder ink. More device makers are joining the scheme, but current partners include HP, Kenmore, Illy and Epson. No matter what you’re buying online, there’s no need to rifle through your wallet for a credit card any more, with a plethora of new ways to pay. Many smartphone users have become used to paying for apps and products by using a handset’s fingerprint recognition technology. And lucky owners of the iPhone X can simply gaze at their phone to make a purchase thanks to facial recognition technology and Apple Pay. But it’s expected that we’ll soon be able to buy goods by using our voices thanks to assistants like Siri as well as gadgets such as Amazon Alexa. The only problem for consumers being that it might make splashing the cash on a new jacket or games console that bit too tempting.